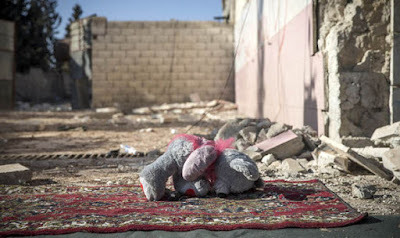 DEPRAVED Islamic State terrorists are using inconspicuous items as booby traps to hide bombs, turning cuddly toys, dolls, fridges and televisions into lethal weapons. The shocking claim has been made by Syrian doctors working with Medecins Sans Frontieres (MSF) in the north of the devastated country. They say bombs have also been planted in roads, fields, houses and children’s toys as fighters retreat - leaving behind countless explosive devices. The seemingly innocent-looking devices are designed to detonate as soon as they are touched. MSF also warned that booby traps and mines were being deliberately left in doorways or under objects likely to attract the attention of children. Karline Kleijer, MSF's emergency manager for Syria, said: "It is extremely dangerous for people returning to their homes. The charity has called for clearance work to be stepped up in order to save lives. According to MSF’s latest report, ‘Set to Explode’, hundreds of people have been killed or maimed returning to their homes and villages in areas once held by ISIS. With some bombs encased in steel, they are designed to inflict maximum damage and cause high numbers of casualties through shrapnel. In the weeks after Daesh fighters were pushed out of the Ayn Al Arab/Kobane areas in 2015, MSF doctors recorded 67 cases of death or serious injury from 45 explosions. Médecins Sans Frontières runs six medical facilities in northern Syria. The charity said that over four weeks last summer, hospital staff in the Manjib area alone treated more than 190 people injured in explosions using such devices. Similar methods were also deployed by ISIS last year in the Iraqi city of Mosul. Kurdish forces working alongside British and US troops uncovered more than 50 tonnes of explosives from areas controlled by ISIS - including bombs hidden inside soft toys in a direct attempt at targeting children. The "creative" explosives are believed to have been designed to attract the curiosity of unsuspecting civilians - leading to soldiers to warning people to suspect everything they come across, from ordinary water hoses to bundles of discarded clothes.